Please note that Williams System 7 games are no longer supported. Mainly Black Knight, it still has issues on some games. Another fix is in the works. Since I do not get reports of what games these are being used in, it's tough to know a percentage. 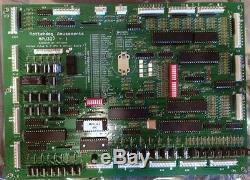 This board replaces both the MPU board AND the Driver board for ALL Williams System 3, 4, & 6 pinball machines listed below. Benefits over original Williams MPU and Driver board. Eliminates the extremely problematic interconnect connector that fastens the original boards together. Eliminates the need to swap out game ROMs. Game is selectable via DIP switch. Comprehensive on-board diagnostics using custom (Leon's) test code via DIP switch. Uses 6802 instead of 6800 microprocessor. Uses a single commercially available oscillator component for timing. Uses Williams WPC style controlled lamp circuit design (TIP107). Uses Logic Level FET drivers for all solenoids and lamp controls. Uses sockets for common failure components (micro, PIAs and RAM). Uses a low voltage reset to keep microprocessor from locking up. Plenty more parts available from Big Daddy Enterprises! The item "Brand New MPU327 MPU/Driver Board for Williams Sys 3-4-6 pinball machines" is in sale since Saturday, October 13, 2018. This item is in the category "Collectibles\Arcade, Jukeboxes & Pinball\Pinball\Replacement Parts". The seller is "bigdaddyenterprises_pinball" and is located in Saint Joseph, Missouri. This item can be shipped to United States, Canada, United Kingdom, Denmark, Romania, Slovakia, Bulgaria, Czech republic, Finland, Hungary, Latvia, Lithuania, Malta, Estonia, Australia, Greece, Portugal, Cyprus, Slovenia, Japan, China, Sweden, South Korea, Indonesia, South africa, Thailand, Belgium, France, Hong Kong, Ireland, Netherlands, Poland, Spain, Italy, Germany, Austria, Mexico, New Zealand, Switzerland, Norway, Ukraine, Croatia, Chile, Colombia, Costa rica, Panama, Trinidad and tobago, Guatemala, Honduras, Jamaica.